We’re Looking for Young Heroes! Round Table is primarily a fellowship organisation for young men, but our calling is an ideal way to raise money for local causes and put on events and activities for the local community. Over the years we have established a number of events, one of the first was our annual Family Fun Day in Dorridge Park (August 31st this year); there is our Santa Sleigh at Christmas; and more recently we have introduced a beer festival which is held mid March at the Knowle British Legion every year. With the exception of the beer festival, we always get lots of help from younger people at our events. Whether it is through displays such as the children of StarStruck musical theatre and Learning Curves at our Family Fun Day or practical help setting up events and collecting money with the Santa Sleigh, it is always striking how ready and willing the children are to help. Through our system for donating money to local causes we also get to hear about the great things some of our children are doing. 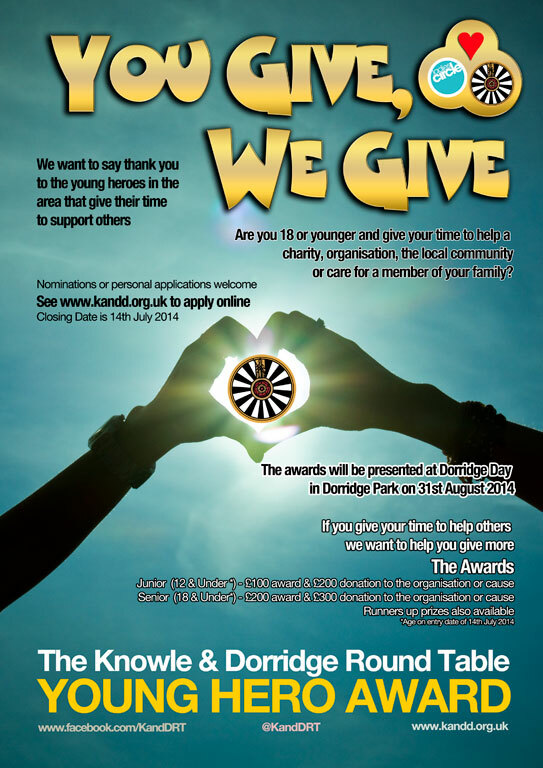 It is with this in mind that Round Table are working with our sister organisation Ladies Circle to introduce an award to the young people in our community. In addition there will also be a number of runners up prizes. The deadline for submissions is the 14th July anyone interested in nominating someone else or themselves should, with parental permission, go here to apply online. We are forming a panel from members of the community to help decide upon the winners and there will be presentation of the award at Dorridge Day, on Sunday 31st August. We hope that this award is a great success and is something else we can repeat each year. Good Luck to all entrants!